Many of us wish we could sleep more…others sacrifice sleep in order to “do more” for fun, school and work. It’s a dangerous precedent glamorized by many celebrities and successful business people. What’s so bad? Poor sleep harms every organ system in the body, causes weight gain and increases the risk for cancer. The best performers actually make sure they get more sleep. 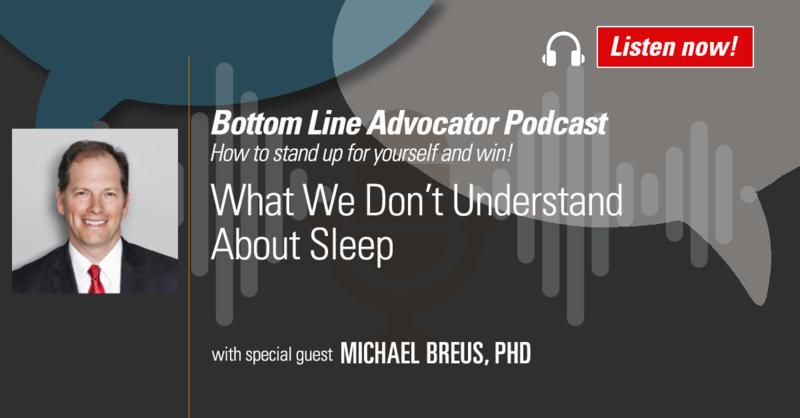 As Dr. Michael Breus explains in this edition of the Bottom Line Advocator Podcast, “Every single thing that you do, you do better with a good night’s sleep. You think faster, you react faster, you’re less emotional, you make more logical decisions, and you perform better.” Listen in as Dr. Breus joins Bottom Line president Sarah Hiner to discuss the misconceptions about sleep and Dr. Breus’s favorite tips and strategies to ensure a consistent, restorative good night’s rest. Be sure to subscribe to the Bottom Line Advocator Podcast on Apple Podcasts!